S2 Resources Ltd listed on the ASX on 19th October 2015 with the ASX ticker of S2R. S2 Resources owns 100% of Southern Star Exploration Pty Ltd (Southern Star), 100% of Sirius Europa Pty Ltd (Sirius Europa) and 100% of S2RUS Pty Ltd (S2RUS). Southern Star owns 100% of the nickel rights of the Polar Bear Project and various geographically proximal tenements, including those that comprise the Norcott Project, and an 80% interest in the nickel rights of various tenements which comprise the Eundynie Joint Venture. 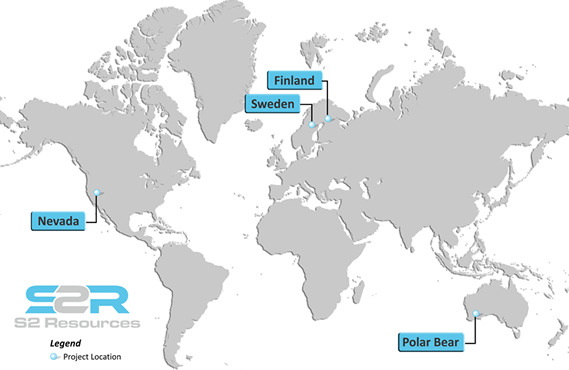 Sirius Europa owns 100% of S2 Sverige AB (S2 Sverige), a private company registered in Sweden, which owns the mineral exploration titles in Sweden. Sirius Europa owns 100% of Norse Exploration Pty Ltd (Norse), which in turn owns 100% of Sakumpu Exploration Oy (Sakumpu), a private company registered in Finland, which owns the mineral exploration titles in Finland. S2RUS owns 100% of S2RUS LLC, a private company registered in Nevada, USA which in turn owns 100% of Nevada Star Exploration LLC (Nevada Star), which is earning in to the joint ventures in Nevada.